Our AAACare team is honored to provide care for many wonderful people. We are also humbled by the kind words these individuals have shared with us. These girls have been a Godsend to our Family! From walking my moms’ dog to giving my Dad overnight care, I just can’t say enough about Theresa and her team. I have never seen any company go over and above the way they have. Extremely compassionate and go above and beyond to support our family. They really are a part of our family. My family and I met with Tom Lee today to discuss care options. He was very patient and kind with our questions. He was honest and open on the costs involved. He also addressed concerns we had. 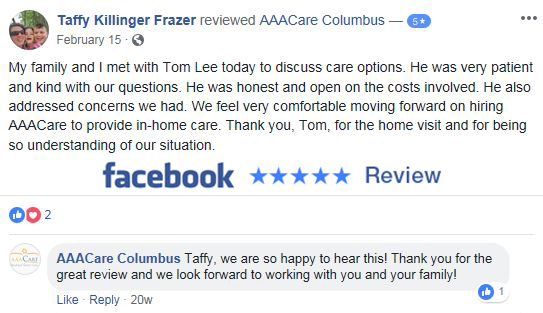 We feel very comfortable moving forward on hiring AAACare to provide in-home care. Thank you, Tom, for the home visit and for being so understanding of our situation. Thank you for choosing AAACare! We value your feedback! Please take a moment to review our service.